Preheat oven to 350°F. In a medium bowl, whisk together flour, salt, cocoa powder and baking soda. In the bowl of a stand mixer fixed with the whisk attachment, combine sugar, butter, eggs and food coloring. Combine water, vinegar and buttermilk in a separate bowl and, while the stand mixer is mixing on low, alternate pouring in flour mixture and buttermilk mixture. Once mix is combined and lump-free, fill 24 lightly greased baking cups in cupcake pan(s) 3/4 full with the batter. Bake about 20-25 minutes or until a toothpick inserted in the center comes out clean. Cool about 10 minutes in the cupcake pan(s) before removing and allowing to cool completely on a wire rack. Refrigerate cupcakes for at least 1 hour before frosting. Make sure frosting is at room temperature before using, too. Every year for Valentine’s Day, instead of getting all gussied up and going out to a fancy restaurant (where we’ll probably worry more about the check than enjoying the food in front of us) we’ve made it a tradition to get dressed up and have a date night in. He buys good, higher-quality food than we would normally get and whips up a delicious home-cooked dinner. I’m in charge of dessert. 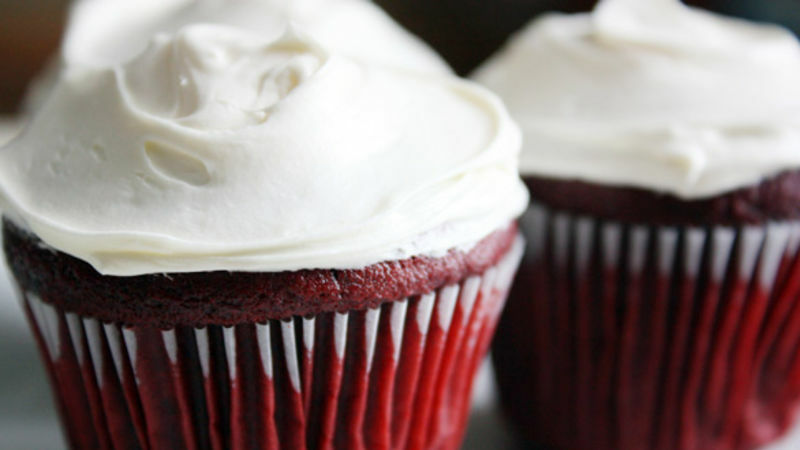 Though I’m usually a sucker for making some elaborate, outrageous and often complicated dessert, this year, I’ve decided to go a little simpler (without sacrificing deliciousness) by making this Red Velvet Cupcakes recipe for our Valentine’s Day. These pretty little cupcakes are not only rich, moist and tasty, they’re also quite festive with their brilliant red color and bright white cream cheese frosting (my favorite). Plus, cupcakes are always much more fun to eat than cake – though I still do love my cake! Though I decided to top my cupcakes with Betty Crocker Whipped Cream Cheese frosting, you can use whatever kind of frosting you fancy. You can even plop candy hearts or Valentine’s Day-colored M&Ms in the center of the frosting, just to make it more interesting. These chocolate-flavored cupcakes are a great way to show your loved one on Valentine’s Day how much you care about them. Much better than the old box-of-chocolates standby!